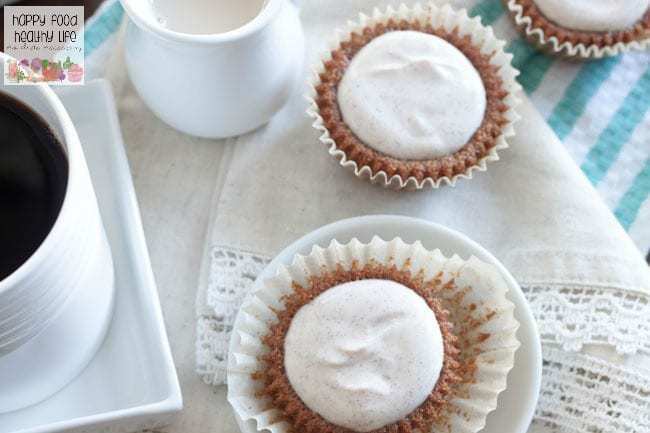 These Healthy Gingerbread Muffins are healthy on their own, and with a vegan option, anyone can enjoy this holiday-spiced treat. 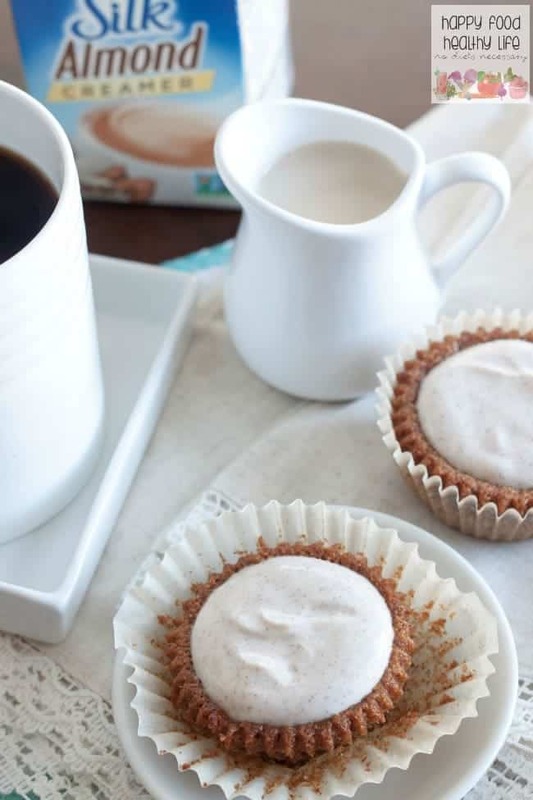 Perfect along with your coffee or as a dessert! The holiday season is well under way, and I have to admit, I’m a little (or a lot) overwhelmed by it all. Not only is there a ton of work for foodies like myself this time of year, but there are the normal tasks that require my attention as well. You know, the shopping, the baking, the decorating. And don’t even get me started on having to come up with a place to move that dang elf every single night! As much as I don’t want my kiddo to lose his belief in all the magical holiday things, part of me feels it would make it all a little bit easier. At what age did your kiddos learn the truth? Regardless, there is always so much work to be done from the week of Thanksgiving until kids are all in bed on Christmas. It’s go-go-go for those 4 or 5 weeks in between. But I am a firm believer that especially in these busy times, it is so important for us to take time for ourselves. You know. Bake something a little special full of holiday cheer. Pour a delicious mug of tea or coffee. And just breathe! If you’re fortunate enough to have some time alone with the kids are at school, that is the perfect time to take a break and enjoy a little “me time.” But I know me time is very hard to find for most of us. And that is why I will make an event of it. Seriously. Whether it’s quiet time for your kids or its your spouse’s turn to take on the kid-duties, this is your time to enjoy your special treat behind closed doors. You can share with them later! I don’t know if you’ve noticed, but I love to use Silk dairy-free options in a lot of my baking. It’s full of flavor and adds a moist-ness to my baked goods. 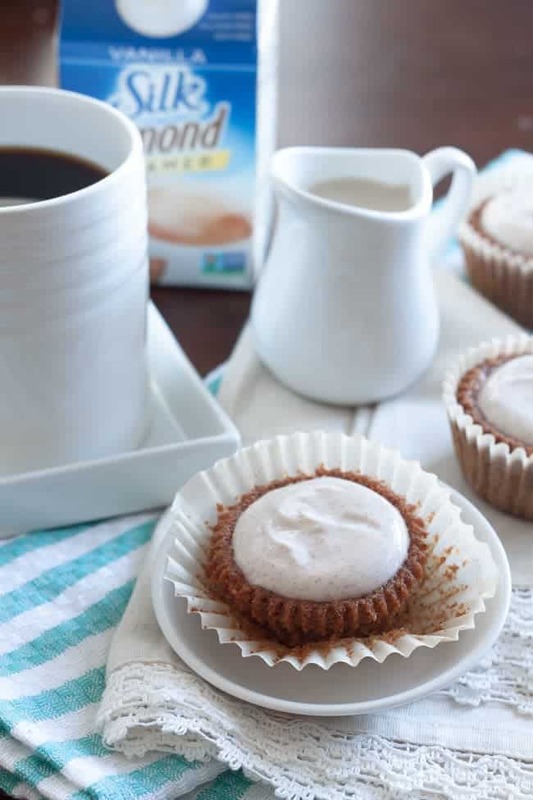 Seriously these muffins are so soft, and I credit the new Silk Vanilla Almond Creamer for that! And the best part about it is that once you have it on hand, you can use it to doctor up your coffee for this special little holiday getaway that you’re creating for yourself. Speaking of get-aways, I know we all love to getaway for some one-on-one Target time, and that’s exactly where I picked this Silk Almond Creamer up, using the Cartwheel app to get 5% off between 12/1 – 12/24/15! Sure can’t beat that, right? You can also grab a Dunkin’ Donuts or International Delight Creamer while you’re at it for many coffee flavors. They all have awesome Cartwheel discounts! While you’re at it, I’m sure you’ll make your way over to all the holiday decor, because can you really resist? I personally am in love with their new plaid table settings for the holidays. They have a monogram mug that is totally calling my name and that would be perfect for this little special date with myself! How do you take time for yourself during the holidays? Dessert? Or breakfast? This Gingerbread Treat can be either one! Preheat oven to 350 degrees F. Line 18 muffin tins and set aside. Cream together brown rice syrup, margarine (or butter) and sugar until light and fluffy. Bean in tofu (or egg) and applesauce. In a separate bowl, sift together flour, baking soda, spices, and salt. Add flour mixture to molasses mixture along with Silk and stir until smooth. Pour into prepared cupcake liners until about 3/4's full. Bake for 25-30 minutes until tops spring back or a tester inserted in the center of the cakes comes out clean. Let cool before frosting. To prepare the yogurt frosting, simply combine all ingredients and place a dollop on top. Serve immediately. All leftovers must be stored in the refrigerator if they have been frosted. Awesome! 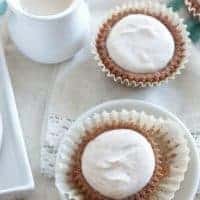 I just made a batch of my healthy gingerbread muffins over the weekend, but I never thought to add a “frosting.” OMG — definitely doing that next time!! My son absolutely loved adding the “frosting” and even got excited when he realized he could make up a batch himself with the greek yogurt and ended up making a “layer cake” with 2 muffins 🙂 total mom win! 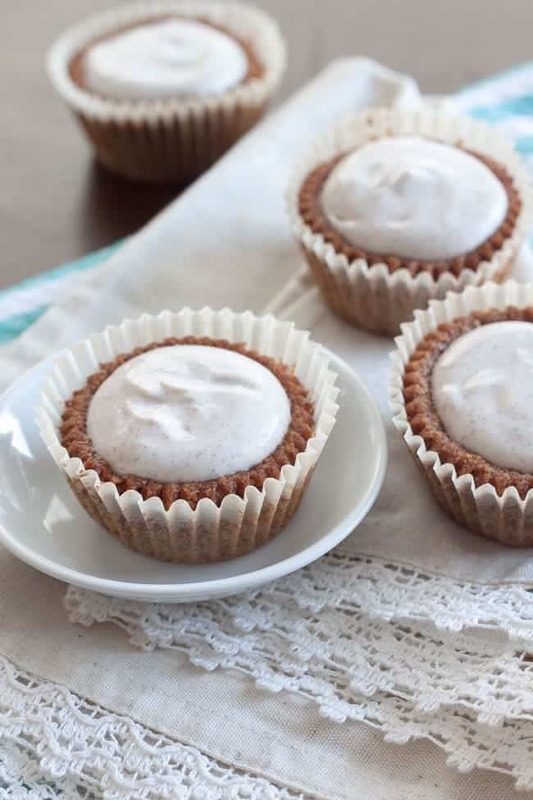 Yum, these look amazing, gingerbread is one of my favourite flavours!